Every time I make a Bolognese I do something different. Sometimes it’s just the availability of ingredients that cause me to change the recipe. Sometimes I just want to try a different twist or measure the ingredients differently. In the end I am always looking for the ultimate Bolognese. My twist for this Bolognese is I will roast a majority of the key ingredients rather than saute in the pan. 2 cans or 28 Oz of Whole Peeled Tomatoes with Juice. First pre-heat your oven to 400 degrees farenheit. In a shallow baking pan add your 1/4 cup of olive oil. 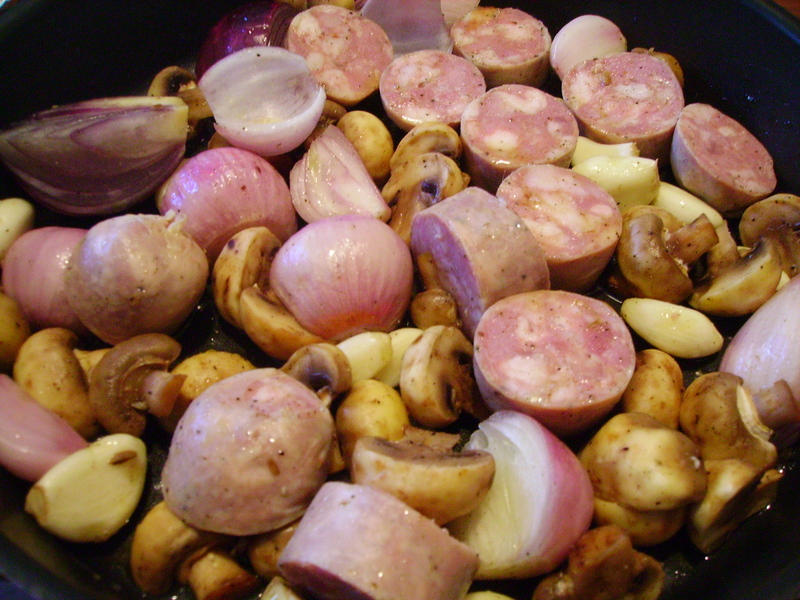 Then add your Garlic cloves, red onions, shallots, sausage, button mushrooms, a 1/2 tbl salt and 1 tsp of pepper to the pan. Mix the ingredients so salt, pepper and olive oil coat the vegetables and meat. Place in the center of the oven for 10-15 minutes, remove, stir, and then place in oven again for another 10-15 minutes. While your items are roasting add your ground pork to your sauce pan. No oil or butter is needed due to the fat content with the ground pork. Begin to brown the ground pork and add your minced onion, minced garlic, salt, and pepper to taste. When the meat is about half-cooked add your whole peeled tomatoes and basil. When the roasted items are done take them from the oven and add to them to the sauce except for the the garlic. Smash the garlic which should be like butter now and then add it to the sauce. 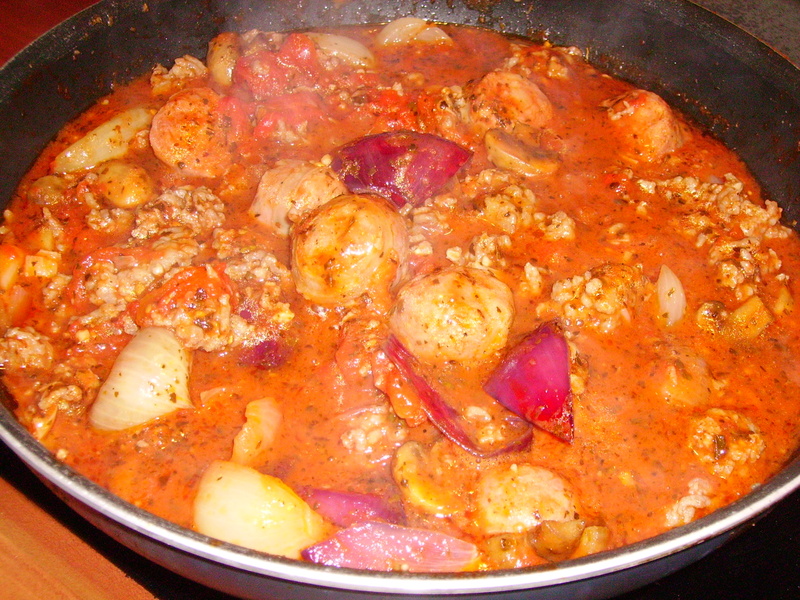 Bring your sauce to a boil and then reduce the heat and let simmer for 20 minutes covered. While the sauce is simmering you should have had your water boiling with a pinch of salt and 1tbl of olive oil. Add your pasta to the water and cook al dente. When the pasta is complete, drain, rinse with cold water, and then plate. Pour the sauce over top and add some grated romano cheese. This is a beautiful and delicious Bolognese where every bite has a fork full of oversized treats. 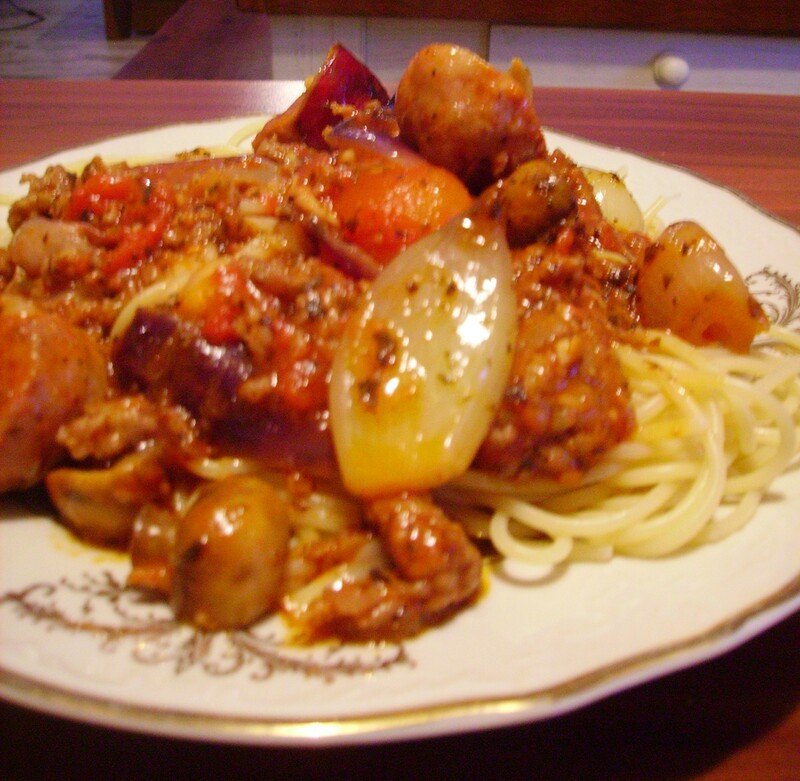 Big chunks of onion, hearty Italian sausage, chunks of tomatoes, wonderfully roasted button mushrooms, or perfectly flavored ground pork. Truly one of my best where the ingredients are clearly visible in every bite from your fork. 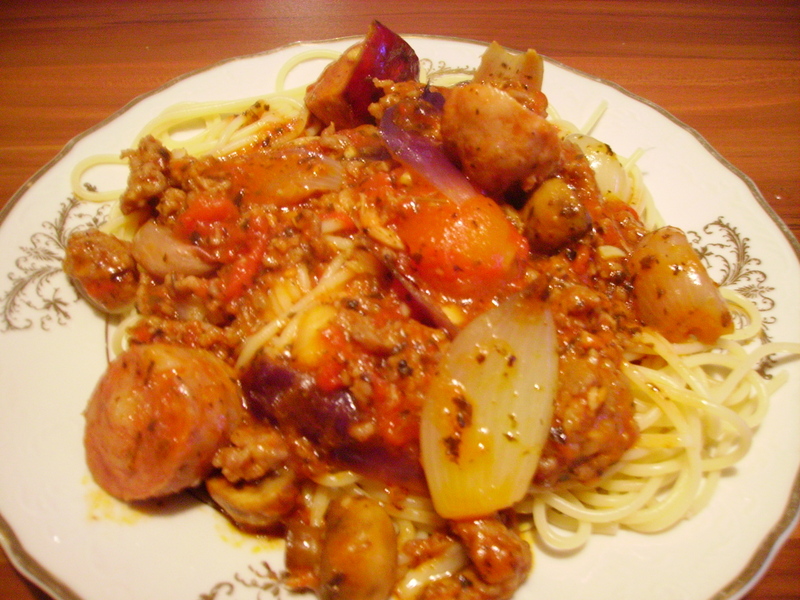 This entry was posted in Basil, Bolognese, Button Mushrooms, Cheese, Dinner, Extra Virgin Olive Oil, Food, Garlic, Herbs & Spices, Italian Cuisine, Italian Sausage, Meat, Olive Oil, Onions, Pasta, Pecorino Romano, Pepper, Recipes, Red Onions, Roasted Garlic, Roasting Garlic, Salt, Sauces & Marinades, Shallots, Spaghetti, Tomatoes, Whole-Peeled-Tomatoes. Bookmark the permalink. One minor point of procedure: Adding salt and pepper “to taste” to uncooked pork is an invitation to trichinosis. I imagine most of your readers are aware of this, but you may want to consider rephrasing that sentence for the benefit of anyone who isn’t. On the other hand, there is much to like about this recipe. I’ve recently discovered the virtues of roasting in contexts where I would ordinarily saute, so this is well timed. Oh this looks great but do you mind some unsolicited advice about the pasta? Never rinse pasta as this not only cools it but it takes off all the starch that helps the sauce stick to it. And the oil in the water is not needed, just stirring to keep it from sticking. I am going to try this sauce though because my son has been asking for a bolognese sauce again. Thanks! Thanks Michelle, I appreciate you taking the time to give out some advice. However, I rinse the pasta for the exact same reasons you state against it. I want to cool the pasta because I tend to cook al dente and shocking it with water stops the cooking process. If I did not do that it would continue to cook a bit more. The pasta will get warmed up again when I add the sauce. I also rinse the pasta because I want to get rid of the excess starch, its like triming the fat from a steak, I don’t mind a little fat, but I want to taste steak not fat, and in this case, the pasta and not the excess starch. As you stated I put the olive oil in the water to not only prevent sticking, because I don’t have time to constantly stir, but also to add a bit of flavor along with the salt I sometimes throw in. I suppose cooking sauce is like cooking chicken soup, there are thousands of recipes for the same thing. Thanks again for taking the time to comment, and please fill free to give out free advice anytime, I do not mind at all. I guess it’s true, we all have our methods. It’s funny, huh? Thanks for subscribing. And I’ll be sure to let you know how the sauce turns out for me. My favorite food is rustic Italian. It’s homey, comfort food. I’ve never made a Bolognese sauce, but I think I will try this one. Lovely dish! Jim, This is sounds delicious! I love roasted veggies and the addition to your sauce is a great idea. Enjoyed reading your blog, thanks for checking out mine! While I usually roast the garlic, last night was the first time I roasted the onions, shallots, mushrooms, and sausage together with the garlic. It really came out very good. I nice sweetness to the sauce. Thanks for stopping by and taking the time to comment.